Our shop has an extensive range of local & Organic produce and the best selection of Organic wines and Beer in Hastings. On the shelves you can find our handmade Museli and Granola, Hastings honey and our jams and marmalades. Our tea room serves leaf tea & the best Italian Coffee in town. With an ever changing menu of cakes from handmade New York Cheesecakes to traditional Coffee & Walnut cake with candied walnuts. 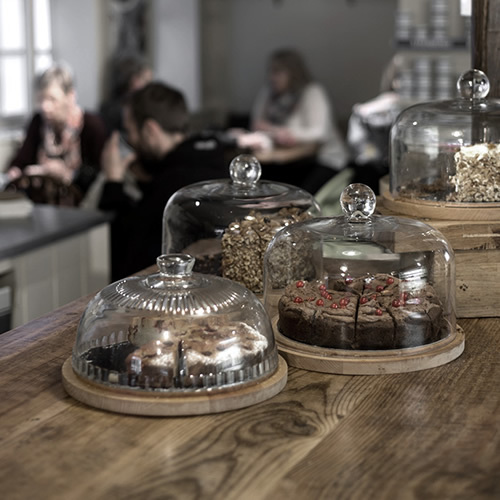 We are forever changing our menu in the shop so please don't be disappointed if your favourite is not available, as we do like to bake with the seasons. To keep life interesting we always have a daily special, these are some of our favourites: Black pudding scotch eggs, Chocolate, Rye and Sea salt cookies, local smoked mackerel quiches, Cheese & ale sourdough and Beetroot & Goats cheese sourdough.